Leucosyrinx verrilli, copyright Worldwide Conchology. 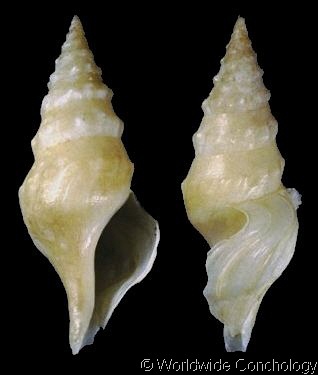 Leucosyrinx is a genus of moderate-sized to large conoid gastropods found in deep ocean basins (Powell 1966). Characters (from Powell 1966) Shell moderate- to large-sized, up to 73 mm, of light build, elongate-fusiform, with tall turreted or pagodiform spire, and long straight or slightly flexed, unnotched anterior canal. Protoconch small, globular, of 1.5–2 smooth whorls. Adult sculpture usually of axial nodes on peripheral angle, and plain spiral cords or threads on lower part of whorls. Sinus moderately deep, occupying whole of shoulder slope, apex broadly shallowly concave; subsutural marginal fold absent, sinus commencing at suture; sinus confluent below with considerable forward arcuate projection of outer lip, accentuating appearance of sinus depth. Colour pattern usually absent, occasionally axially flamed in reddish-brown; thin pale periostracum usually present. Operculum ovate to leaf-shaped, with terminal nucleus. Radula bearing a pair or marginal of modified wishbone-type, one of the two basal limbs being separated and superimposed upon larger element of tooth, which tapers to a simple point.